He completed his residency at Sinai Hospital in Michigan. University of Southern California (USC). Degree from the Sackler School of Medicine. Dr. Torbati has been happily married since 1975 and is the proud father of two successful and caring children. He speaks English, Hebrew, and Farsi. 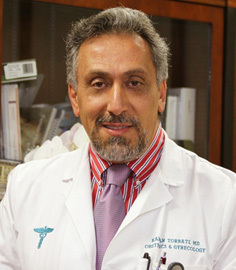 Dr. Torbati has been providing clinical care in his successful private practice in Encino since 1993. Since Residency he has advanced his education by attending numerous courses to OBGYN practices and in fields of Robotic & Minimally Invasive Surgery & Laser female cosmetic pelvic reconstruction. Certified by the Fetal Medicine Foundation of the United States for genetic fetal evaluation by ultrasound. Chairman Peer Review Committee and Vice Chair of Dept of OBGYN at Providence Tarzana Hospital from 2011 to 2015. Diplomat of the American Board of Obstetrics and Gynecology since 1995. Fellow member of American College of Obstetrics and Gynecologists. Certified by AAAASF for ambulatory surgical center. Member of Society for Cosmetic Surgeon, Certified by State of California. Fetal Medicine Foundation for Cosmetic Fetal Screening. *AAAASF is the Accreditation Association for Ambulatory Health Care, also known as the Accreditation Association or AAAASF, was formed in 1979 to assist ambulatory health care organizations improve the quality of care provided to patients. Currently accrediting over 3,000 organizations, the AAAASF is the leader in ambulatory health care accreditation.